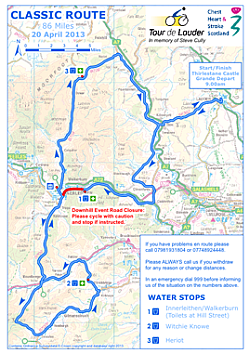 See the image on the right to download the route information. Grand Depart Thirlestane Castle 9.00am on 21st April 2018. It is not a race but is intended as a fun (if that's the right word) day out. Please click HERE to link to Garmin Connect to download GPX file. Registered with and regulated by the Office of the Scottish Charity Regulator (no SC018761), Chest Heart & Stroke Scotland is a wholly Scottish charity. It also operates as CHSS and is registered in Scotland as a company limited by guarantee, no SC129114. Copyright © 2019 Marketing Concepts. All rights reserved.